Audio professionals seek the highest quality possible when selecting speaker systems. Image: Genelec studio monitors. In this new series, John Watkinson discusses loudspeakers from several aspects including; how they work, the way they are perceived by the listener, the psychoacoustics of speakers. We’ll conclude this multi-part series by considering the psychology of selling and owning them. As with any technology, myths abound. If, in this series, the opportunity arises to dynamite a few, then so be it. Broadcasting began with sound radio, and sound was soon added to early silent movies. Television began with both sound and picture. And sound continues to be an important part of television broadcasts, whether truly broadcast or carried over some IT structure. Today there is scarcely an information device, be it a cell phone, tablet, laptop, Satnav, or game that isn’t capable of emitting some kind of sound. Whilst the broadcaster or disseminator of sound has no control over how it will finally be reproduced at its destination(s), it is at least necessary to have the ability to monitor the quality of what is leaving, as well as checking during prior production steps. There is an argument that any originator of sound, such as a broadcaster or recording studio, should have monitoring equipment that is as good as or better at revealing faults than anything the consumer is likely to listen with. I suggest that is only an argument, and it has not universally been won. With few exceptions, the loudspeaker exists to provide some kind of stimulus to the human auditory system (HAS). In the same way that making television and cinema work requires some knowledge of the human visual system, then making loudspeakers work most effectively requires knowledge of the HAS and that will be considered in this series. Did it make a noise? 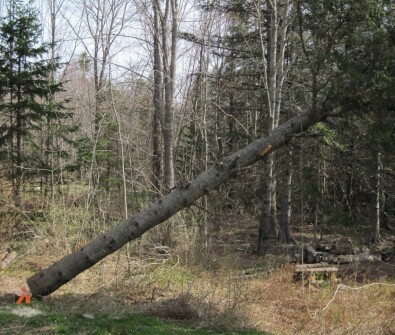 There is an old saying that if a tree falls in the forest and there is no-one around to hear it, does it make a sound? The answer depends on perspective and how sound is defined. To the physicist, sound is the propagation of pressure disturbances through some kind of gas, from blast to ultrasonics. By that definition, the tree made a sound. If sound is defined as an auditory system detecting an acoustic stimulus, then there was no sound. The HAS can only operate over a certain range of frequencies and can only tolerate a certain range of levels. Perhaps the old saying could be replaced by asking what happens if someone blows a dog whistle and there is no dog? Whilst physics may be mathematical, it is also extremely reassuring. The laws of physics are unmoved by national boundaries, the passage of time and the utterances of politicians or marketing departments. Once people get involved, with their variable education, hopes, emotions, traditions and so on, it all gets rather messy and success comes to those who can see through the mess. One of my many hats is that of an acoustician and loudspeaker designer, and it is often assumed that I will be interested in hi-fi. Well, in a sense I am interested in hi-fi. Not in the products, but in the psychology. At one time the technology needed for accurate reproduction of sound didn’t exist, and it became the norm to strive for an improvement through endless listening and tinkering. Then tradition took over and the subjectivist tinkering became more important than the goal. In a parallel to travelling, rather than arriving, it seems better to tinker with audio than actually achieve anything. As a result hi-fi has not achieved anything, except possibly a reputation, and indeed cannot achieve anything, because it is a process and not a goal. Audio enthusiasts all have different ideas about what makes the perfect speaker. Shown here is a set of Ixoost-Xilo-51 Bluetooth speakers. As a friend recently pointed out, the last thing a hi-fi enthusiast wants is a perfect loudspeaker, as then he would have nothing to do. In order to avoid arriving at the perfect loudspeaker, modern understanding of the HAS must be ignored or denied, and physics must be replaced with mythology so tradition can be kept alive and the snake oil can keep flowing. Those of us who do not subscribe to such thinking should not be too smug. No one has ever looked at a TV or a cinema screen and confused it with the real thing. It may not even be necessary. With a few exceptions, such as reversing an RV or monitoring a prison wall, watching screens is a form of escapism, and realism isn’t on the menu. That goes for sound too. As with so many human senses, we don’t perceive what is actually there, but instead we perceive what social and other pressures suggest is there. This means that many people will happily listen to sound quality that is significantly worse than what is possible because it is only serving as a reminder, in the same way that a nasty die-cast replica of the Eiffel Tower transports the owner back to Paris. Given the ubiquity of mediocre sound, I also suspect that many people simply don’t believe that anything better is available. Even if the conscious accepts mediocre sound, the sub-conscious doesn’t and that is the origin of listening fatigue, which mysteriously disappears once a quality threshold is crossed. 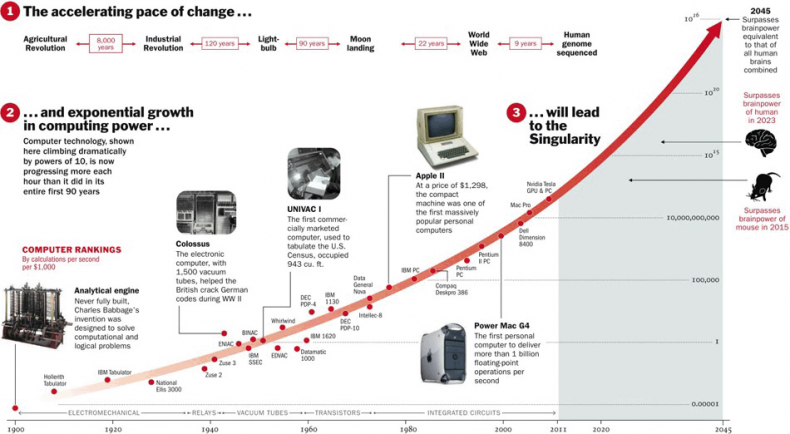 While much of electronics continues to benefit from Moore’s Law, the physics of speakers limit its application. Image Reddit. Looking on the bright side, tangible progress in loudspeakers has come from the requirements of a completely different market, that of IT. The relentless advance described by Moore’s Law has seen anything to do with computing or communications shrink in size, cost and power consumption. Whatever can be digitised is fair game, including audio waveforms. Unfortunately, Moore’s Law does not apply to acoustics. Even so, the enormous pressure to reproduce audio from ridiculously small devices such as iPads and tablets has led to some remarkable results. In almost all other areas, loudspeaker design seems to be stuck firmly in the mud without enough traction to escape. One driver for progress in larger loudspeakers may be the cinema. Projection has just about reached the limit for the amount of light power that can be shoehorned through a gate. The future of very large bright screens may lie in direct radiation. This is great for the picture, but such screens do not let the sound pass through, and will require cinema sound to be re-thought. The ubiquity of IT also means that the loudspeaker of the future will not have any terminals, but will instead obtain the sound to be reproduced via some wireless means. By definition this requires the loudspeaker to be active, which in itself has advantages. Those advantages form a subject in itself. 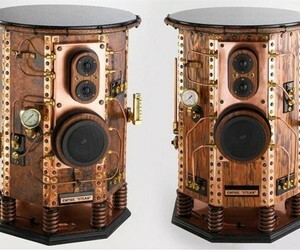 Empire Steam Steampunk speakers. When it comes to speaker design, practically anything goes in the search for perfection. And for many audiophiles, looks can be just as important as sound and cost is no object. The list price of these speakers is $12,600. Image: Empire Steam. This is an extensive topic and it is only possible in this first part to give some idea about where the series is going. If it is accepted that the goal is to please the Human Auditory System, we need to start there, to look at how it works, what’s critical and what doesn’t matter. One important fact that will emerge is that few people ever hear a sound source of any kind, including a loudspeaker, the way it really sounds. In the real world, the original sound cannot be separated from the response of the environment: reflections, reverberation and so on. It will therefore be important to see how the HAS deals with that, because it will also tell us how to design loudspeakers that work well in reverberant environments, like musical instruments do, rather than only in specially treated rooms. The HAS is directional, can readily determine where direct sounds and reflections are coming from and can separate them. If we wish to make any progress with stereophonic or surround sound, that mechanism needs to be understood and respected. Stereo and surround sound create sonic images, whereas TV and cinema create visual images. The difference is that in TV and cinema there are standards for measuring the accuracy of the image, whereas in audio there are none. No one believes that the pixel count is the only parameter that determines the quality of a display; there are plenty of others I don’t need to mention. However, when it comes to loudspeakers the only parameter of interest seems to be the frequency response. Often this means it must be extended at all costs even if it means damaging other parameters that are not measured. Clearly there is more to loudspeaker design than frequency response. By looking at the parameters that affect the degree of respect shown to the HAS, it is possible to create a specification or goal for an ideal speaker. Once that specification is understood, meeting it is a straightforward engineering challenge. Can the challenge be met? Of course. The human ear is imperfect and if the imperfections in the speaker are less than the imperfections in the ear, then they will be indetectible. Part 2 of our series will consider how the HAS works in real listening environments and how that mechanism influences loudspeaker design. 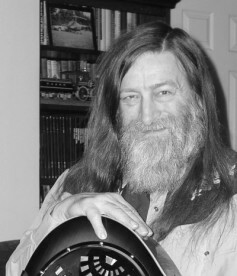 Editor’s note: You may wish to read other John Watkinson articles published on The Broadcast Bridge.